Pierre Guillaume, who’s got both Parfumerie Générale and Huitième Art to play with on top of his collaborations with Phaedon and Laboratorio Olfattivo, has been known to try out different expressions of his accords in different projects. Most recently, the verbena note that popped up simultaneously Phaedon Verveine Figuier and Parfumerie Générale Corps et Ames Eau de toilette apaisante (which means “soothing”). The latter is a variation on the 2006 floral chypre of the same name, which will be maintained in the collection. The immortelle and leather lining has been ripped out, as well as the enigmatic “Melati wood” note (which must refer to jasmine sambac, known as “melati putih” in Indonesia, Wikipedia helpfully explains). This tweaked Corps et Ames sharpens the bright/dark contrast of the original version, with a twist on the chypre template: the citrus top note is verbena – not the tea but the fresh leaves, boosting the mint and citronella facets of geranium, another leaf. In turn, the rosy facets of geranium, so strong they actually smell like the flower at times, are set against a velvety background of patchouli coeur (a fractioned distillation that eliminates the camphoraceous, moldy aspects of the oil). A trio of leaves then since patchouli is also extracted from them, slightly feminized by the green animalic lushness of jasmine sambac, floating on a huge cloud of Serenolide, the fruity-tinged Givaudan musk Daniela Andrier used in overdose in Martin Margiela Untitled. An inspired pick for a scent that boasts “aromatic benefits” thanks to the soothing properties of verbena…Even the musk is zen. Despite this claim, the scent doesn’t wimp out on the broodiness that haunts the chypre family line. It is a splash of sunshine heating a somber mossy bed, drawing out penetrating aromatic and floral notes, with a slight underlying bitterness. 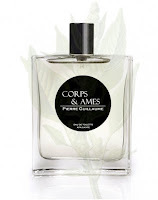 With Corps et Ames 2012, Pierre Guillaume demonstrates that when a perfumer second-guesses himself at a stage where his skills and outlook have matured, the variation can be even better than the original. But also that it’s still possible to compose a true chypre with today’s palette, as fiercely chic as its forebears yet totally modern. To share the love, I am doing a draw for a 2ml spray sample of Corps et Ames Eau de toilette apaisante: just drop a comment about your favorite Pierre Guillaume and why you love it – or if you don’t actually own any, which one intrigues you most. I dont own any full bottles of Pierre Guillaume perfume, but I have samples of Parfumerie Generale Private Collection Cuir d'Iris and PG03 Cuir Venenum and I adore both. Cheesegan, do I detect a pattern here? You're in. Kostas, I was just re-trying Myrrhiad for an article I'm writing, it's beautiful, isn't it? You're in. I think I'll go with Cadjmere as it was the first from the line I fell in love with. My favourite PG has to be Ilang Ivohibe as it's quite a chameleon -one moment I think it has a masculine feel, the next it is very girlie. The vanilla is never oversweet, the white flowers bloom but are subtle, and the whole is spiked with lime. Sometimes it reminds me of a discontinued lime version of Old Spice that my father wore, then at others it is like a Guerlain. It keeps me interested and happy! Ines, nothing like a first love, right? You're in. Jillie, you've intrigued me, I'll have to re-explore Ylang Vohibe... You're in. There are so many Parfumerie Generales that i love for their complexity and androgyny - Coze, Intrigant pachouli, Yuzu Ab Irato, Felanila, L'Ombre Fauve,Papyrus de Ciane, Pyschotrope + Querelle.Is Corps et Ames EDT Apaisante overwhelmingly feminine or is it androgynos also ?. Chris, considering the notes -- verbena, geranium, etc. -- though the brand touts it as a feminine I'd say it's definitely a his-and-hers scent. I don't think I have ever even tried a PG... Myrrhiad does sound interesting, and I've heard good things about Coze. This one also sounds very good. Fernando, there were already so many when I discovered the brand five years ago I didn't know when to start even then! But they're well worth exploring. I have heard of 2 limited edition Parfumerie Generale fragrances from about four years ago called Marilyn et John and Haramens. I cannot find any info on these, anywhere. Did you ever come across these two. Chris, nope, never did. Pierre G did mention Haramens to me as a pretty impossible accord. It's the name of his shop in Clermont-Ferrand, though. The name is the contraction of "Haram", sacred, and "encens", incense in French. The other name is easier to figure out! I am fairly new to perfumes and have not tried any Parfumerie Generale scents yet, most unfortunately! Cadjmere and Praline de Santal look particularly interesting to me. Anat13, as I said in a comment above, it can be quite daunting to try and catch up with such a large collection! I only had a sniff of Praline de Santal but it felt like one of those Pierre Guillaume gourmands that make me feel like tying him down to a chair and force-feeding him candy -- he's a very slender fellow, so I suspect he's not giving in much to his sweeth tooth! Bois de Copaiba,it warms me it makes me confortable and uplifts my mood. Civava, that's definitely something to look for in a fragrance! I have never tried any of these fragrances. the one you descibed in the article sounds great and i'd love to try it. I LOVE Papyrus de Ciane. I didn't the first time I tried it, but I pulled out the sample 2 years later and fell in love. It's bitter, dark green and mossy and it's my favourite out of my 70 bottles. Maureen, with pleasure: you're in! Krista, that's very high praise indeed! It's a great fragrance. When he came to the new Les Senteurs in london a few months ago, PG demonstrated that Coze was a Gourmand literally good enough to eat. He sprayed some Coze on his wrist and licked it off. Have you seen him do this kind of thing in France ?. Chris, I've often seen my cat do it, but what I've seen Pierre eat was usually actual food. I haven't tried any of PGs scents yet. I think this one interests me most, I love chypres! Eva, then you might want to look up Papyrus de Ciane at some point, it's a great green chypre. Carmencanada, too funny about force-feeding him candy. He certainly does not look like he partakes of sweets often! I have a love affair with PG14 Iris Taizo (Oriental), which captivated me from the first time I put in on. It is one of the most unusual irises, rich and suffocatingly spicy. To my nose, it is comparable to Guerlain's Myrrhe et Delires, if not for the massive dose of cardamom. Recently, I've tried a sample of PG Cuir d'Iris but the jury is out on that one...too early to tell as I've spent very little time in its company. I would be grateful to be entered in a draw. Thank you! Anat13, mind you, he may just be really into fitness... or one of those frustrating young men who never packs on a gram no matter what! Hermoine11, do I detect an inclination for iris? You're in! I don't own any PG fragrance yet, but they are available locally. Papyrus de Ciane and Iris Taizo are two of those I am most eager to try. Please enter me in the draw,I want to explore all aspects of chypre perfumes. I love green chypres in particular. i love many PG's, from l'eau rare matale to felanila to l'ombre fauve. i have yet to meet one i don't like. I love PG' s Praline de Santal. There is such an expert delicacy to this composition, it is very warm and nuanced. I would love to enter the draw, thank you! Stellaglo, so you're a real PG aficionada, then! You're in. Tuberose absolute, I'll definitely have to give that one more of a try, it's getting lots of love. Well, I don't own, and have not tried, any Pierre Guillaume, but I'm very interested in trying Naiviris from the Huitieme Art line after EauMG's recent review. My favorite PG is, in fact, Corps et Ames. For me it is the perfect sophisticated chypre--intriguing enough to satisfy, but polite enough to wear to the office. The Coze wrist licking incident was true. Honest. Did you ever come across a Parfumerie Generale release called Cuir Santalion ?. Susan, I haven't tried that one either yet! Camille, then you'll probably be interested in this variation. Chris, I never doubted it! And, no, I still haven't caught up with the PG in the shelves, much less with the ones that aren't! Pierre Guillaume is always so creative! Love Harmatan Noir and Huiteme Art's FAREB, still have not tried Phaedon creations as they are so hard to find! Ela, he certainly is creative... The Phaedons are not all by him, and are somewhat simpler in style than the Parfumerie Générale, which I prefer as a brand. TimeaZsofia, and you're right to be, it's a very interesting perfume! I like several of PG's creations but so far my favourite is Myrrhiad. It sounds deceivingly simple written out as tea-myrrh-vanilla, but it has just the right balance of the components. Thanks for the draw! Mikael, I love Myrrhiad as well (it's featuring in my next article for Citizen k). Katya, Felanilla is quite worthy of attention -- a very modern interpretation of vanilla. Cuir Venenum - my all time favourite! Gwen, that was one of my first loves in the brand, with Cozé! It took me a while to "get" PG, but now it is one of my favorite lines. I really love L'Ombre Fauve. The patchouli in it is fantastic. Hi, Denyse. I'm fascinated by Cuir Venenum (which morphs for me between the intended leather + orange blossom and a sort of grape kool-aid), L'Oiseau de Nuit (I adore labdanum), and Cuir d'Iris (which smells a bit like unwashed hair -- in a good way). And I do like the original Corps et Âmes. Jarvis, the grape Kool Aid connotation is actually part of the orange blossom note (you'll also get it from Vamp à NY and Sweet Redemption, for instance). And though I'm not overly familiar with Cuir d'Iris, it's say there's a naturally fatty, sebum-like aspect to orris butter... must be boosted by the leather. Yes, the grape kool-aid is the smell I've come to associate in my mind with methyl anthranilate. Jarvis, weird isn't it that something that comes from nature would end up smelling like a synthetic beverage? In fact, that's the weird thing: lots of naturals do give off prominent synthetic effects. But aren't synthetics isolates of things found in nature? Which are sometimes easier to manufacture in quantity via chemical synthesis, rather than distilling and fractioning raw materials. I think perhaps we "read" them as "synthetic"/artificial because they don't usually occur in nature in such high concentrations. Jarvis, some synthetics are nature-identical, some aren't at all. You're right in pointing out that our perception of them as synthetic is triggered by a stronger concentration (though in another post Marla said that Texas wisteria *did* naturally smell of grape Kool Aid). But if we'd never experienced an industrial food product containing them we wouldn't make the association. That said, some natural extracts do present synthetic effects as well. Coze and Cadjmere in the winter, then Papyrus in the summer. I can't wait to try the Bamboo, although the other one interests me as well. QuinnCreative, isn't the Bamboo from By Kilian? Definitely the three you state seem to be getting a lot of love, and justifiably so!